This entry was posted in flexbone, army, navy, offense, playbook, veer and tagged Dr. Lou Cella, flexbone, mental conditioning, Offense, performance psychology, sports psychology on May 9, 2018 by Dr. Lou Cella. 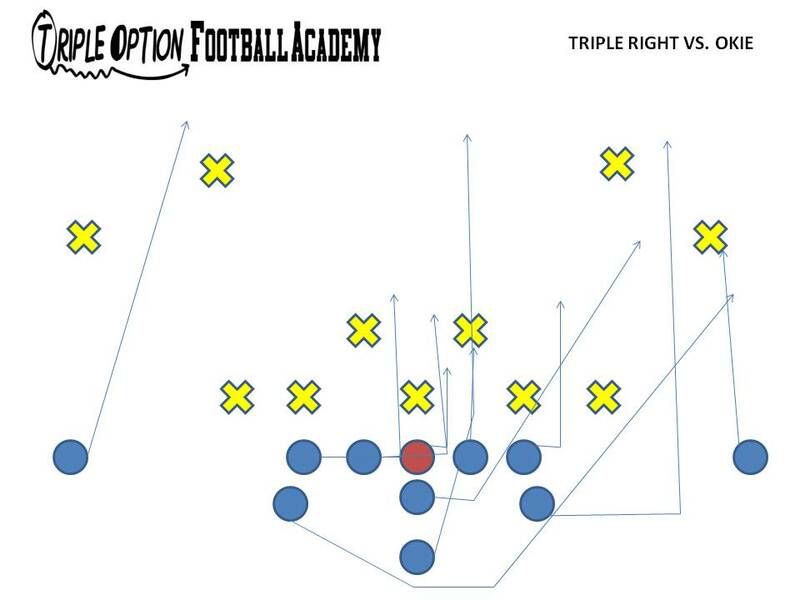 In order to mentally condition your athletes with the Triple Option Offense, there is a six-part process. This is where all 11 players simultaneously technique their assignment. This is where players envision the worst-case scenario from the defense before the ball has been snapped. Unless a lot of players feel good about what they’re doing technique-wise, then THERE IS NO LEGITIMATE MOTIVATION. Those players who take information from coaches and communicate this information through physical action are the best leaders. These are the players who climb the mountain and these are the players whose physical technique gets good fast. The urgency of the player’s technique on the backside of the play tells you everything you need to know about a player’s character. This entry was posted in flexbone, army, navy, offense, playbook, veer and tagged mental conditioning on February 4, 2016 by Dr. Lou Cella. Quiz questions can be found here. Here’s the problem. If you can’t block defensive linemen, you’ll never move the ball, you’ll never score points, and you’ll never win a game. You need to understand why this disconnect occurs to overcome it and win. “I know many coaches would rather install an offense the traditional way by researching it, visiting colleges that run the offense, and then picking coaches for information. I have used that same strategy, and I know that it takes about three years to really gain an understanding of the offense and get players to execute it at a high level. Consequently, in the research method, you do not have any collaboration with experts that are readily available when questions arise or resources that have consistency. We wanted to give our players an offense that they could be successful with immediately. 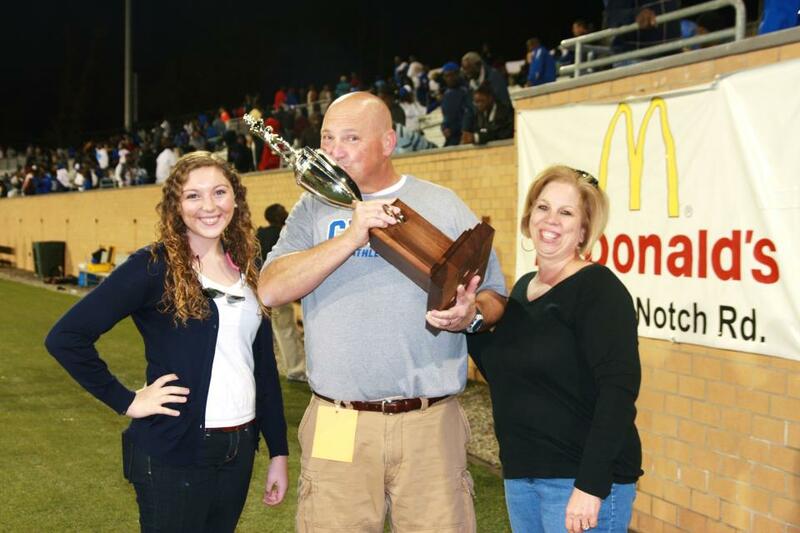 – Dr. Jimmy Woods, Head Football Coach, Timmonsville High School. Went from 1-9 (2010) to the state semifinals (2011) in one year after working with Triple Option Football Academy Owner, Lou Cella. Here’s the solution. 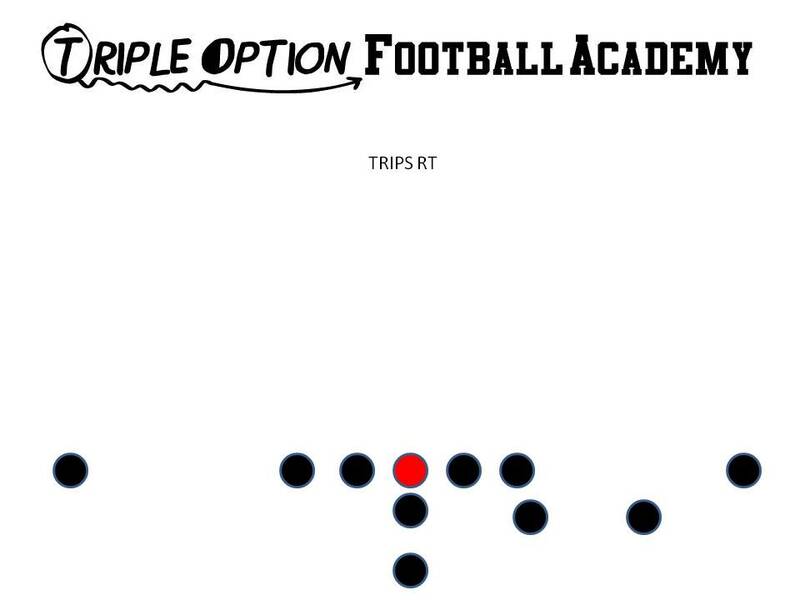 The Triple Option Football Academy. Our mission is to lead the high-performance Triple Option Football Offense environment through sports science and mental conditioning coaching practices. For $997, clients receive the plan to WIN NOW. 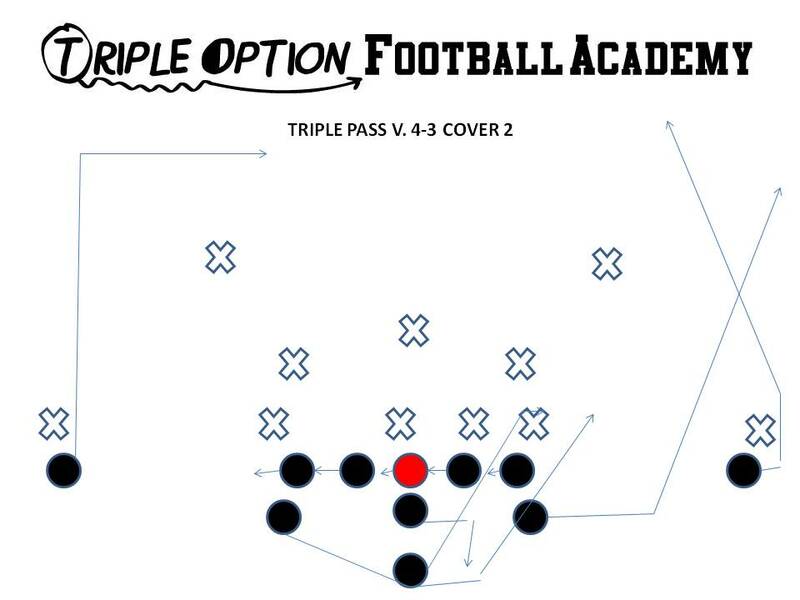 Lou Cella’s Triple Option Football Camp System has helped schools from all over the country achieve significant and immediate success. 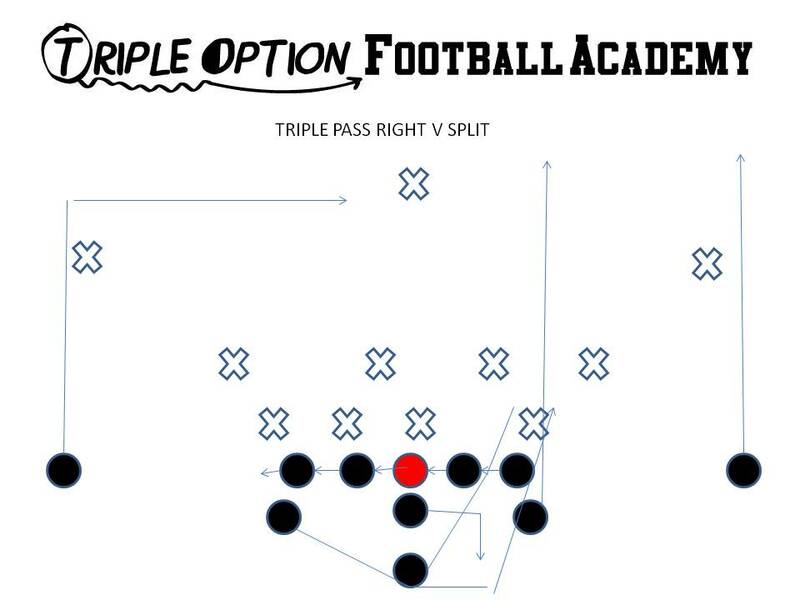 Now, Lou Cella brings you the Triple Option Football Academy, the process to lead the high-performance Triple Option Football Offense environment, complete with sports science and mental conditioning coaching practices. Before the 2010 season, Falls City HS (TX) had never won a regional championship in school history. 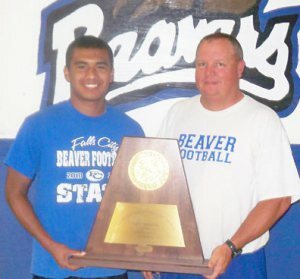 In 2010, after working with Triple Option Football Academy Owner, Lou Cella, Falls City HS (TX) won the Regional and State Championship for the first time in school history in Texas while scoring 680 points in 15 games. 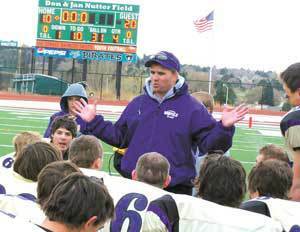 After working with Triple Option Football Academy Owner, Lou Cella, Bayfield HS (CO) had an undefeated regular season for the first time since 1996 and advanced to the state championship game in Colorado. Questions? 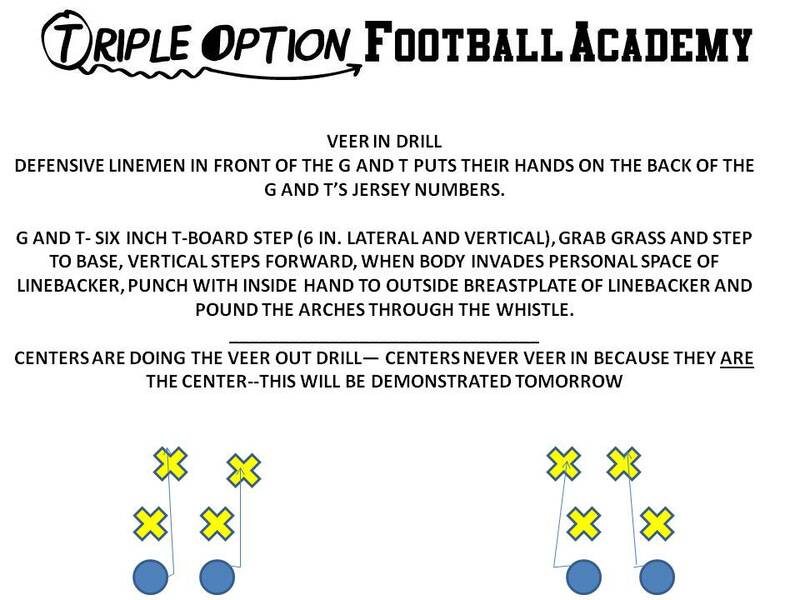 Contact the Triple Option Football Academy at 570 332 0265. This entry was posted in flexbone, army, navy, offense, playbook, veer and tagged 3-3-5, blocking, coach, flexbone, mental conditioning, MIDLINE, navy, Offense, paul johnson, playbook, rocket toss, scoop, sports science, veer on December 10, 2013 by Dr. Lou Cella. 1- Who cancels the Near Deep Defender? 5- Who cancels the Action Key? 6- Who cancels the Backside B-gap? 7- Who cancels the Backside Corner? 8- Who cancels the Playside B-gap? 9- Who cancels the Playside A-gap? 10- Midline Zoom is run when there is a _________ technique. Being able to know the situation and what you should do. Basically, you run Triple, see who makes the tackle, and if the Triple gets blown up, find out who did it, and constrain them on the next play. Being ready to move. Practice involves going faster than game tempo to prepare for the speed of game night. 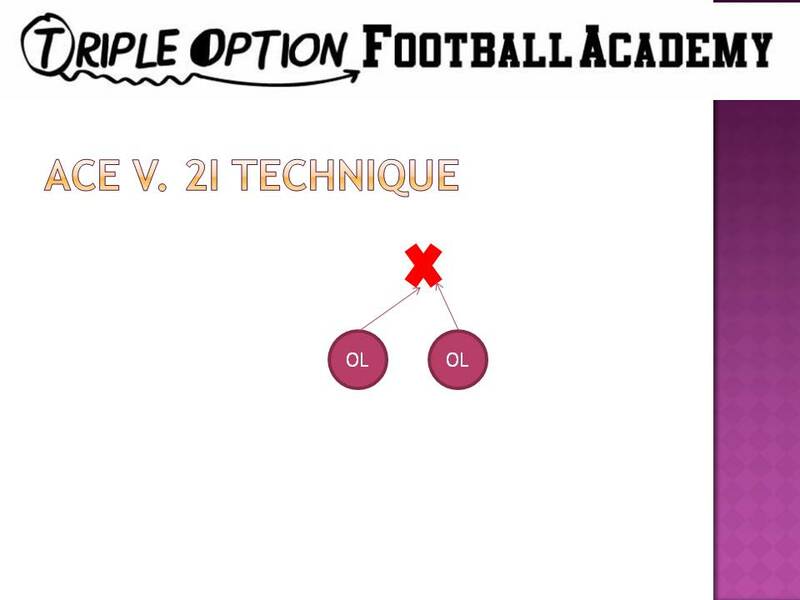 If you seek a smart Triple Option Football program, these two things must occur, and on a daily basis. In Sports Science, the physical techniques utilized in the top 20 percent of the time in games get 80 percent of the results. The Veer, Ace, Base, and Scoop blocks are the blocks utilized to make the Triple and Midline Option go. In order to get a head start on 2014, work these drills all winter and spring long. Let’s take a look at the areas on which to work. 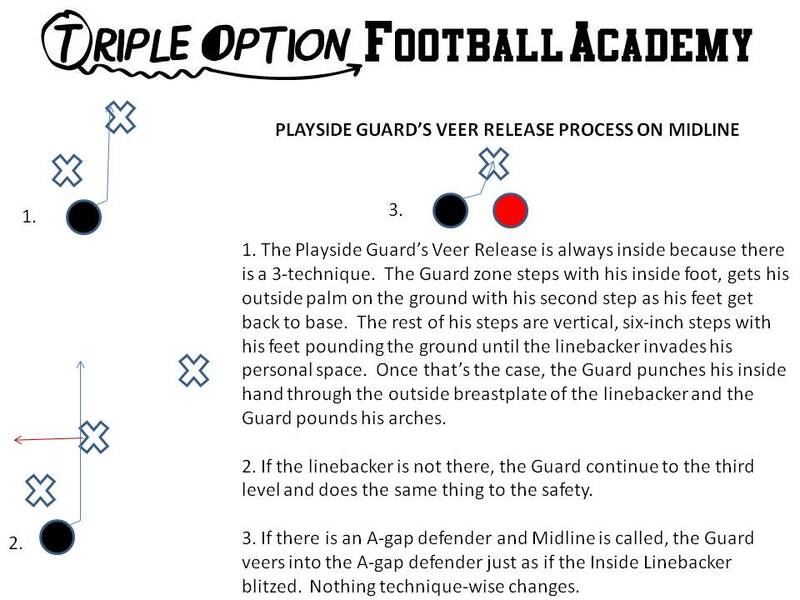 This is the Playside Guard’s Veer Release on Midline. 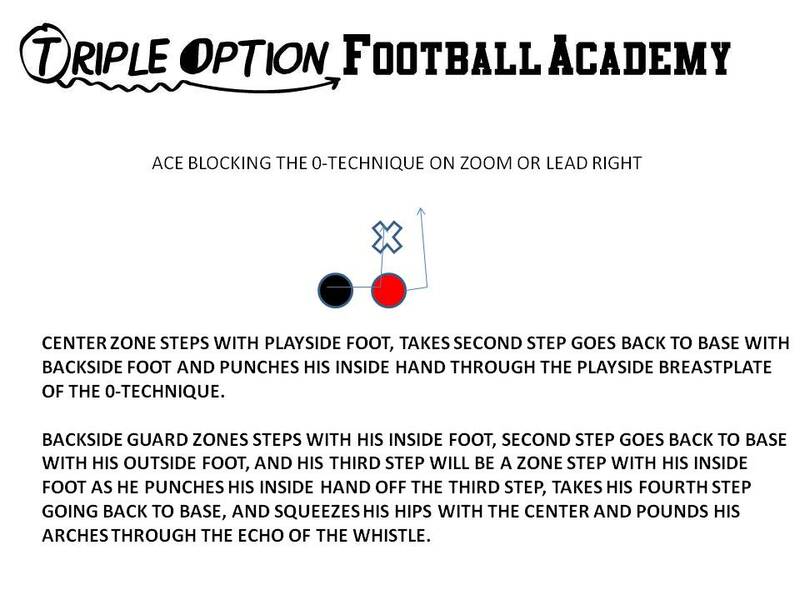 When Ace blocking a 0-technique on Midline, the Center’s first step, which is a zone step to the playside, is the key movement. This step keeps the 0-technique on the backside of the play. 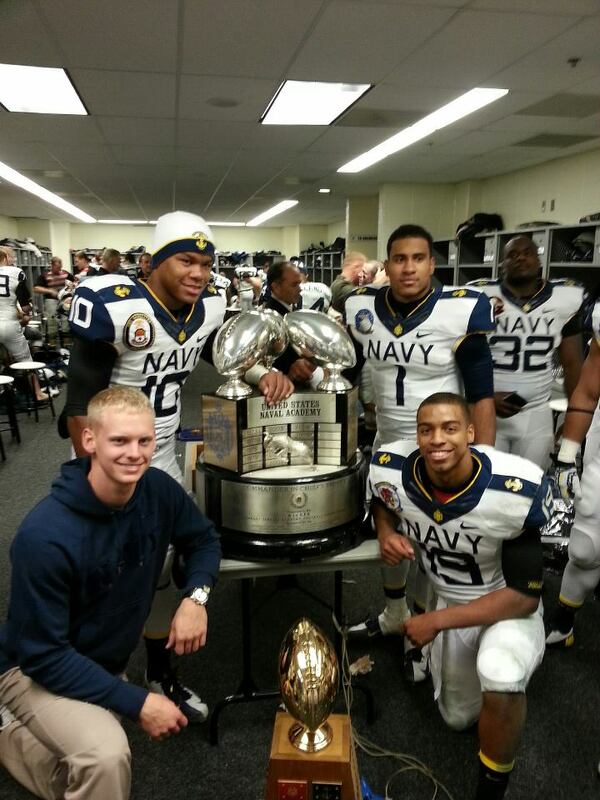 Ok, let’s examine the best Triple Option Quarterback in the world right now–Navy Quarterback, Keenan Reynolds. How many Division-1 scholarship offers did he have out of high school? He supposedly couldn’t play ANYWHERE. 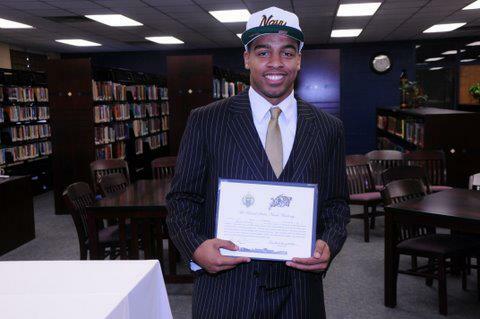 However, HE COULD PLAY AT NAVY–a school with ZERO athletic scholarship football players. 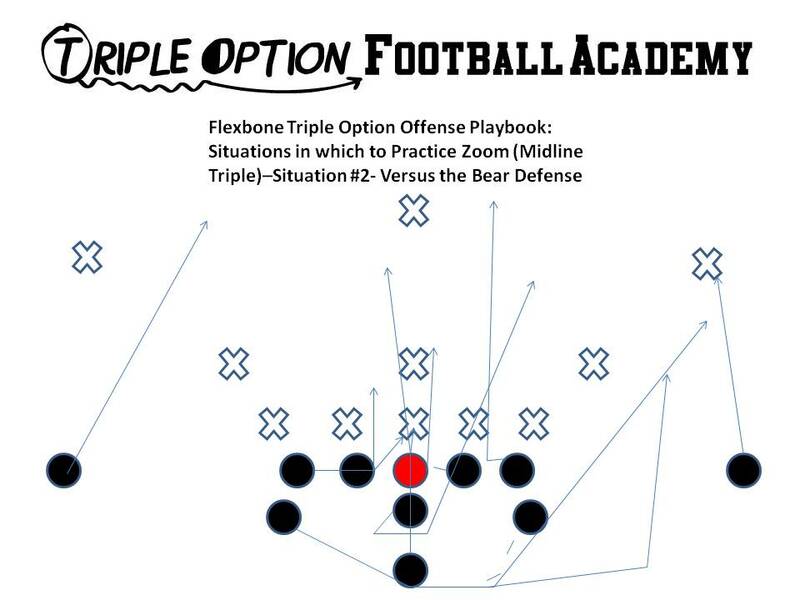 THEY RUN THE TRIPLE OPTION. 12 bowl games in 13 years–with ZERO athletic scholarship football players. 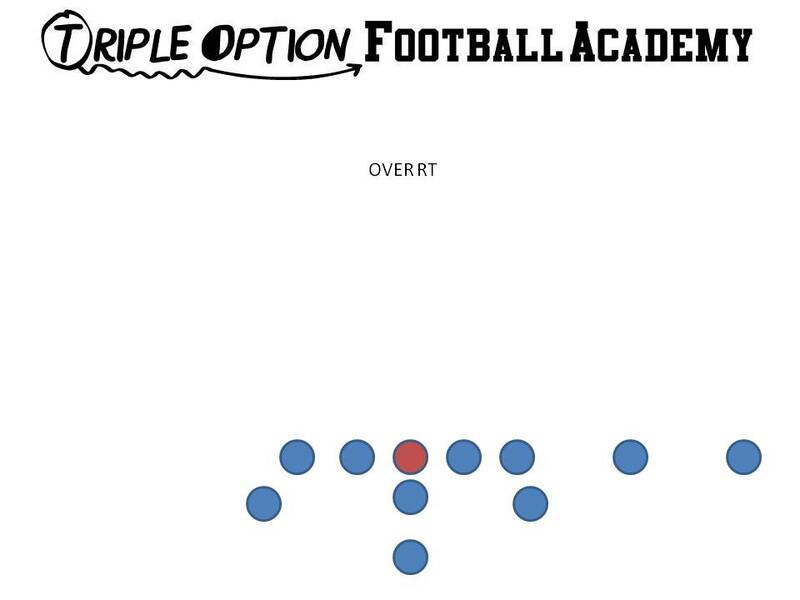 The Quarterback drill process on Triple and Midline Option is a complex process. Yet, this is a PROCESS. 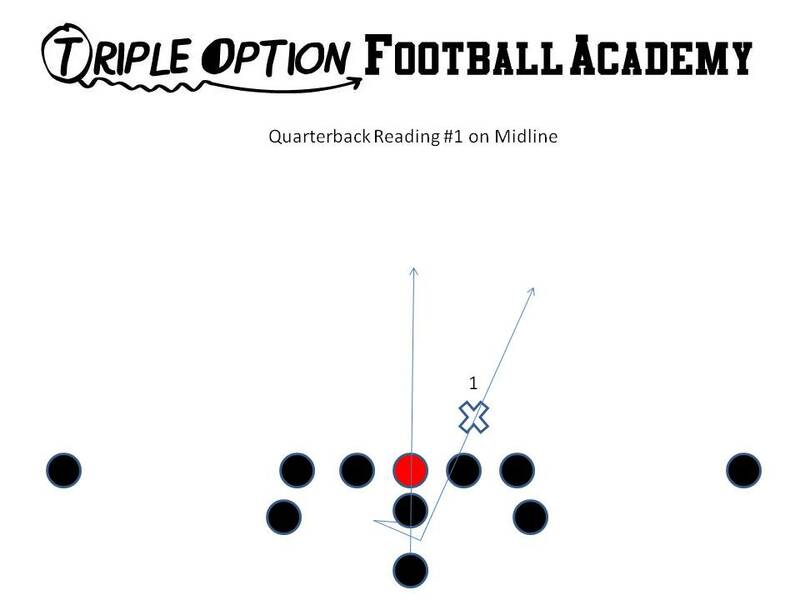 Quarterback Reading #1 on Triple Option. 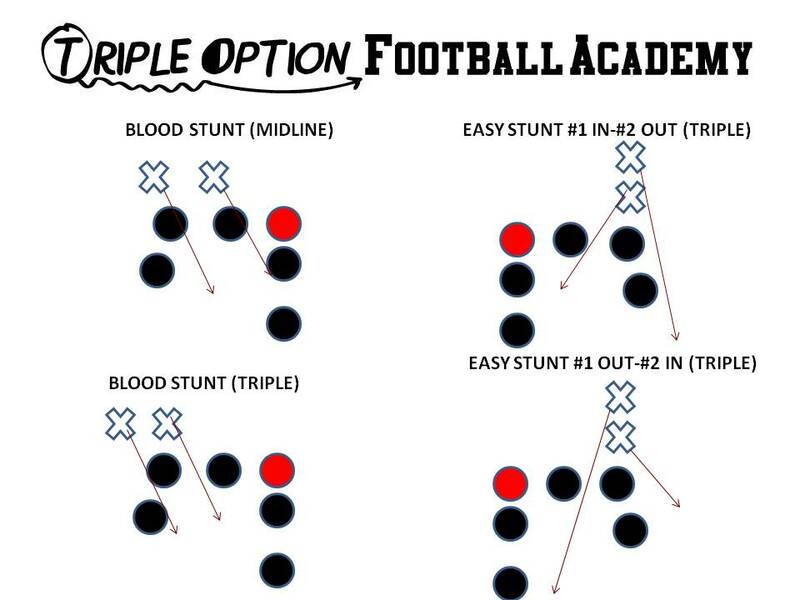 These are the four situations that all Triple Option Quarterbacks must face if they are ever to achieve greatness. The Blood Stunt is when #1 and #2 come hard. The Easy Stunt is when two stacked defenders go to adjacent gaps. QUARTERBACK READING THE STACK ON TRIPLE OPTION SITUATION #3. Triple Option Football Academy. Quarterback Reading the Stack on Triple Option (v. EZ Stunt). Quarterback Reading the Stack on Triple Option (Give Read). 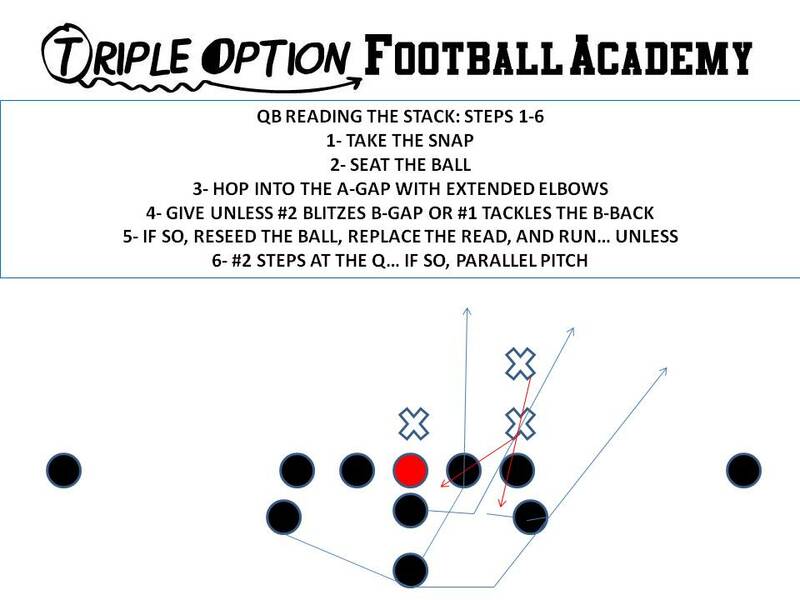 Quarterback Reading the Stack on Triple Option (Process). Quarterback Read progression on Midline. This entry was posted in flexbone, army, navy, offense, playbook, veer and tagged 3-3-5, blocking, coach, flexbone, mental conditioning, MIDLINE, navy, Offense, paul johnson, playbook, rocket toss, scoop, sports science, veer on December 9, 2013 by Dr. Lou Cella. 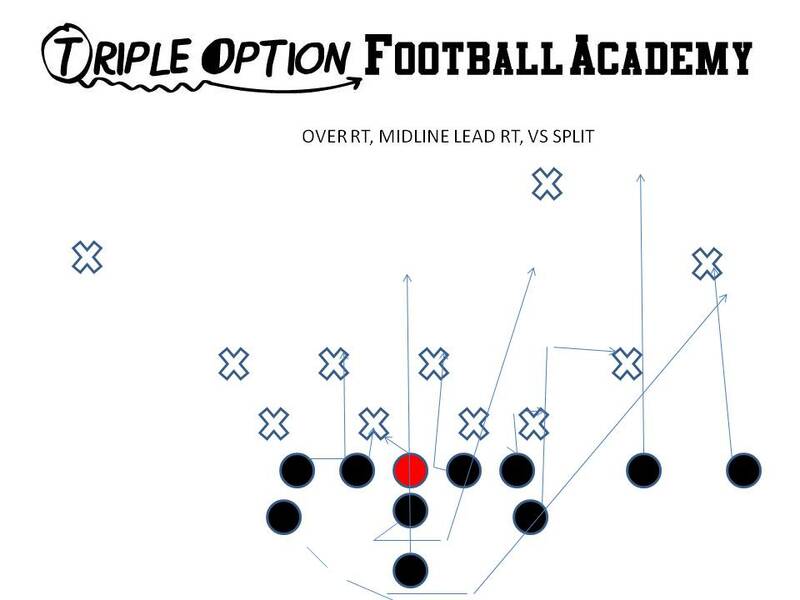 In order to compete with the big boys on your schedule, here are five tips to get more competitive NOW in the Triple Option Offense. 1. Broaden your scope. Consider ways to take on different challenges within your role. Work on more situational football to keep players alert and guessing. 2. Seize opportunities to throw the football. Don’t keep your head buried in the sand. When the safety is flying up or the corner isn’t backpedaling at the snap, it’s time to go deep. 3. Eliminate passivity. Just because you run the Triple Option offense doesn’t mean that you supplicate yourself. You are still coaching offensive linemen to dominate the line of scrimmage with scoops, veer releases, and ace blocks. 4. Prepare for surprises. Always be ready for the STEM and the BLITZ. 5. Recalibrate as you go. Decrease the chances that you’ll be caught off guard. 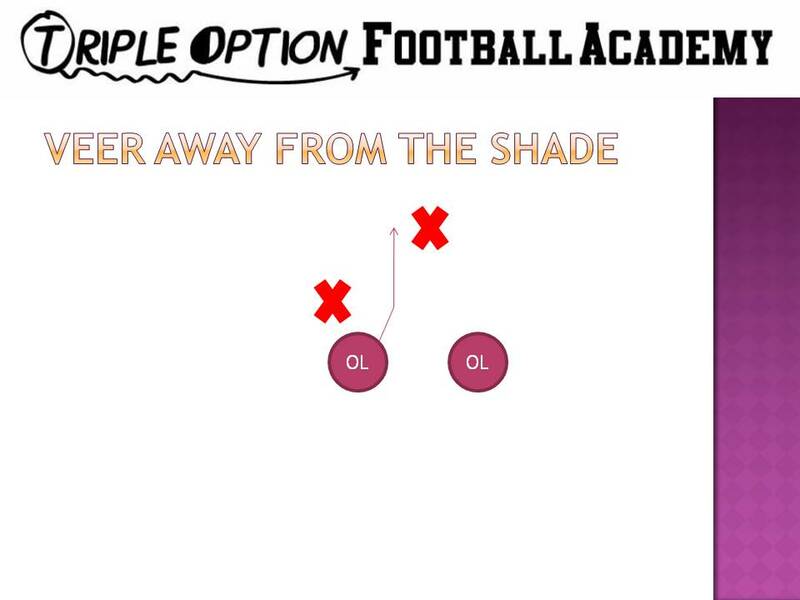 When somebody does something to you and you do not have an answer, there are over 400 articles on tripleoptionfootball.com that assist you in the process. The quiz can be found here.